Dracula Gothic horror can be very appealing to many people. People may like to watch these films for various different reasons such as the graphical nature which can make it look extremely realistic. The blood, guts and gore effects make the film very entertaining as well as alarming; also the thrills these horror films give to the audience can be very appealing. Mainly in horror films there is always good v evil and the audience will almost always want to see the good defeat the evil and this will always happen. It will always be expected. The film I will be discussing is Dracula. The director of Dracula is Francis Ford Coppola; he is a very talented director and had six Oscars by the time he was 36. Astonishingly, he had won many more awards after that as well. This shows that the director would have been exceptionally famous and this would have made the film very popular indeed. The actors that participated in the film 'Dracula' were; Garry Oldham who played Dracula, Winona Ryder who played Mina Murray & Elizabetha, Anthony Hopkins who played Professor Abraham Van Helsing and Keanu Reeves who played Jonathan Harker. Personally, I think they all did a fantastically good job. In this essay the devices I will mainly be focusing on are; the signifiers of genre, the camera angles, the characters, the sound effects, the lighting techniques and the setting. I will explain these devices in great depth. In the most vampire films there are always stereo typical characters and I think that 'Dracula' has stereotypical characters like all vampire films do. For example the way Dracula has been acted out may not come as a surprise to the audience as they have probably seen it somewhere else before. There will also be bats and cobwebs to set the scene and the vampires in this case Dracula, will feed by draining the blood of humans; this would show the audience straight away that the film is a horror. ...read more. This would make it helpful to the audience if they don't understand what is happening straight away. The main character of the film is obviously Dracula. At the beginning of the film he is wearing a metal armour, which is in the shape of a devil as it includes horns. So this may tell to the audience straight away that he be wanted to be presented as a devil. Dracula also becomes the antagonist of the film. Dracula also has an extremely hairy face and long hair. This makes him look shabby and maybe older than he really is. Dracula was a very religious man; he even went to fight for god. This may make the audience think of him as a really good person. But soon this changes when he stabs the cross with a knife. He gets furious when he finds out Elizabetha has left him forever. This turns him against Christianity forever. He then becomes a vampire. As a vampire, Dracula has very pale skin like any vampire would in a film. The director may have wanted Dracula to be presented in this way so that the audience can straight away know what he has turned in to after losing faith in Christianity. He also wears a bright red cloak in part of the film; this may symbolise that he is a vampire and he wants bright red, juicy blood to drink. But still, I personally think, Dracula isn't scary looking enough; I think the audience wouldn't really get frightened by him, they may actually even find him humorous. This is because he is too common - to make it look more frightening and interesting the director should have created a unique look. Elizabetha is Dracula's wife she looks very innocence and sweet. She looks and basically lives as a princess; she wears a crown which shows that she is Draculas princess. When Dracula is away battling Elizabetha thinks he is going to die so she throws herself in the river. ...read more. This shows that Dracula is now going to go on the dark side. This is a bit like star wars. On Rendfield's scene it shows straight away that he is now on the dark side as well. It is all dark and gloomy in the corner he is standing in. There is blue light reflecting on his hair and on the floor. This creates an interesting effect. In the scene where Mina and Jonathon are in the garden there is natural light and it is very well lit. The sun is out and is very bright. But they then walk in to the shade. This may suggest to the audience that they are also going on to the dark side. In conclusion I have learnt that the mise-en-scene does work sometimes and sometimes it does not; it really just depends on how use it. 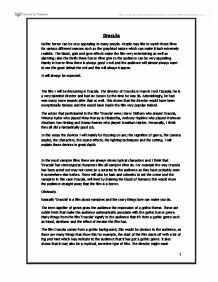 I have analysed each section for example the signifiers of genre, the setting, the characters, the lighting techniques, the sound effects and the camera angles. All these topics would make the film look more realistic and more interesting to watch. But this does not always happen as sometimes some of these effects could straight away make it obvious to the audience that they are unreal which makes it look unrealistic. Personally, I think the film is great and has a good story line. But sometimes the film goes a bit over the top and tries too hard to make it look real but ends up looking fake and scenes that are meant to frighten the audience and make the audience laugh instead. This is quite amusing and seems unprofessional for the film. The director of this film is famous so this would probably make the film a blockbuster. I also think the more famous the actors are the more popular the film becomes as this attracts more people to watch it. I also think the film fits in extremely well with the gothic/horror genre. So over all the film was quite interesting. ?? ?? ?? ?? 1 ...read more. As she is driving towards the mansion you can see the neighbourhood and the mansion next to each other. It now appears to be very dark and mysterious but when Peg reaches the top of the mountain, the mansion seems brighter and less intimidating. There is an extreme close-up of him dazed and shell-shocked by his surroundings, this being emphasised by the lack of sound leaving the audience to focus more on the picture. With someone of his experience and stature left in such a state, imagine how the young Privates are feeling? and haphazardly the shark kills, as if taking life away from them was his right. The camera enters the shark's territory showing his point of view, giving him the power to decide the destiny of these victims. However we are still not shown the shark, we don't yet know, what does it look like? As well as this, Buffy the Vampire Slayer is a prime-time show in 16 countries around the world and therefore has to model it's storylines in such a way as to please everybody. When producer, Joss Whedon, introduced a lesbian relationship into the show, he didn't know what kind of impression it would have on the ratings. are deceased, and yet are unsure whether the master of the house is still living. The lighting changes before the oxygen masks are dropped. The lights switch off briefly making an area of the plane in shadow. This causes the audience to think something is wrong and the darkness is associated with death and evil creating anticipation to the attack. Use of mise-en-scene in &amp;quot;Se7en&amp;quot;. Camera/ editing - use of camera used is the close-up shots. This draws the attention of the audience to significant objects that are important to the plot of the story such as in the opening sequence extreme close ups shot are used widely throughout the clip.